At PTE we like to visit schools up and down the country. We feel it’s important to get a feel of how schools work in certain areas, what unique challenges they face, and how they are doing great work in their own way. In turn, we want to highlight some case studies that show things that we’ve learned about how to run a great school, and what facets of that are replicable across England. Phoenix Academy, an 11-18 secondary school, came out of a predecessor school that went into special measures in April 2016 before being academized, and it then joined the Future Academies Trust (who were the first people in England to really push the idea of a knowledge-rich curriculum) in September 2016. The school is situated on 9.5 acres of land, with modern buildings mixed with several older ones across the campus, including several gyms and its own leisure centre. There are currently 560 children on the roll, with a capacity of 1100. The school has a Progress 8 score of -0.97, which puts it in the bottom three schools in London, whilst 22% of their children got 5 or better in their GCSE English and Maths last year. The majority of the children are recipients of the Pupil Premium. Phoenix Academy is based in White City in West London, in the heart of a large estate with high levels of deprivation. The school is also a stone’s throw away from Wormwood Scrubs prison. Despite these challenging circumstances, it is remarkable how well the school is held together, and clear from even a cursory glance that many steps are being taken to turn around its disappointing academic performance. Oli Knight became the head in September 2017, one year after the school academized. He came from Greenwich Free School, and brought several members of staff with him to form his new senior leadership team, with only the Head of Sixth Form remaining from before. A keen believer in PTE’s principles, Oli has sought to turn around the fortunes of the school with a revolutionary zeal. Outside of work Oli is married with 2 small children. His other passion, alongside his family, is alpinism and he makes regular trips to the Alps and Norway to climb. The fast and light ideals of modern alpinism have influenced his approach to school improvement. How did you seek to make an immediate impact in the school? We wanted to change so much, but the first thing you have to realise is realise what you can and can’t do – there’s no use taking an outstanding school model and dropping it into somewhere in special measures. It just won’t work. Many things can be changed immediately, but some have to be more gradual. The most immediate thing we did was alter the first couple of weeks of term in September, so the school wasn’t running normally until the third week. Week one was solely devoted to staff training – we wanted to recalibrate their expectations for what the school was about, and what we wanted to achieve. We knew that most staff were desperate for the school to work and that they just needed the right systems and structures in place. After that, we brought the year groups in one at a time in the second week, starting with Year Seven on the Monday and moving upwards after that. We were very firm and clear with them, focusing primarily on the new expectations we had and routines we were implementing. Behaviour was the most important thing in the short term, and there’s been a huge change in that. We firmly believe in the zero-tolerance approach, and the difference between the start of the Autumn term and the start of the Spring term is astonishing. By zero-tolerance we don’t mean silence at all times; we simply mean that the adult is in charge and we follow all instructions without delay. In the longer term, a knowledge curriculum with sensible assessment will make the biggest difference, and I think our extra-curricular programme will help immeasurably as well. There’s still a long way to go, and I don’t want to pretend that we are anything other than a clear work in progress, but I passionately believe that this stuff is already making a huge difference. What do you do to maintain pupil and staff wellbeing? One of the best things we do is to offer free breakfast for all staff between 7:30AM and 8:00AM, and then free breakfast for all of the children between 8:00AM and 8:25AM. Most of them take us up on this offer, and it definitely helps with the rest of the day – the evidence about the importance of breakfast is clear for all to see. For teachers, the main changes we’ve made have been reducing workload through improving our assessment practice. We used to have six data drops a year, but we’ve changed that to three, and we’ve removed written comments from workbooks to minimise marking. In time we will drop down to 2 assessment points a year when we feel that the curriculum is designed to enable this. Our teacher handbook is also much smaller than average – we’re asking teachers to do a few things in their lessons, but to do them consistently and to a high standard. We really are serious about ensuring that marking is minimised without failing to assess the pupils – when we had mocks for Year 11 and Year 13, we gave the kids the day off to allow teachers to mark all the scripts. Sometimes taking work home is inevitable in this job, but if it’s happening regularly for teachers that means my team and I aren’t doing our jobs properly. 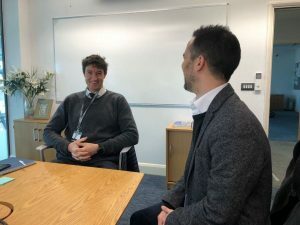 Pupil wellbeing is mostly maximised through the other things I’ve discussed here – the school is now a much calmer and safer environment, which makes a world of difference for everyone. What have you done to curb bad behaviour? When I arrived, the behaviour situation was a really tough one, and turning it around was and continues to be our number one priority. The school was not a calm and orderly one and the site felt unsafe for large periods of the day. The only way to turn this around was a high-expectations, zero tolerance policy. We made it clear from the start of the year that things were going to be completely different, and we have stuck to that. We have a new Detentions Officer, who alongside organising our centrally run detention system, works individually with our most at-risk students and runs small group programmes to help all our students meet our expectations. For example, if you are late to class for any reason you’ll receive a twenty minute detention, whilst if you are found loitering around the school in uniform half an hour after the end of the day you’ll receive a sixty minute detention the following day. By making the boundaries explicit, every pupil knows where they stand, and most have reacted accordingly. It’s important to work closely with parents as well to ensure they understand how important good behaviour is, and we offer support to them wherever possible – for example, I’ve told them all in our most recent newsletter that if they’re having trouble getting their kids off their games consoles, to just give them to me – I’ll happily cut the plug off. What matters most is implementing the behaviour policies consistently and firmly. I’m not afraid to say that we do so with a religious zeal – the word of the behaviour policy is law, and those laws cannot be bent or gotten around. This was hard for many in the first few weeks when they were used to a much more lenient school, but we’re in a much better place now than we were less than six months ago. Going forward it’s going to be absolutely vital. We are unapologetic in our view that the curriculum is central to school life. To paraphrase Michael Young, the curriculum shapes all the thoughts and decisions I make as a Head and sets out what we believe in as a school. We’re in the early stages, but the fact that we’re part of Future Academies helps so much. They were the first people in this country to really take knowledge seriously, and working with the curriculum centre they’ve already done much of the hard work. Their curriculum is a really strong one, and it’s up to us to implement it. It will obviously have more of an effect on the younger kids, but even with the Year 11s you can see that it’s making an impact. In the long run, I think a knowledge-rich curriculum will be the real difference-maker to these children. Enrichment through sport and other activities is a huge part of our day, with participation in some form of extra-curriculars at the end of the school day a requirement for all pupils, as well as lunchtime sport delivered by qualified coaches. We also have clubs like philosophy club and debating, which often includes pupils debating against the teachers. That in particular has proven to be popular, and it’s intellectually stimulating for those that take part. We also do a lot of partnership work with Latymer Upper School and this has really helped to increase the expectations some of our pupils hold for themselves and the life they want to lead. We have a huge Adventure Learning programme that we’re really proud of – we even have a dedicated head of Adventure Learning to sort it all out. We see Adventure Learning as being one of our twin pillars of organisational life. The other of course being the curriculum. Year Seven all do the initial Adventure Learning programme, whilst Year Eight step up to the wilderness survival programme, which throws them into the woods and teaches them to survive with little but their wits and the survival knowledge they’ve been taught. For Year Nine we offer the Duke of Edinburgh Bronze award, whilst in Year Ten it’s Silver and Year Twelve have the opportunity to complete the Gold award. We’re also taking loads of the kids to climb up Mount Snowdon in March – as a keen climber I’m really looking forward to that. As a school you have to decide what you can and can’t do and so we focus on the emancipatory experience of the outdoors but this means we can’t do other things. The point of all of this is to challenge the kids – we want to help make them better versions of themselves. Some of the Adventure Learning stuff can be really tough, especially for kids who have never been anywhere like The Lake District before – and that’s ok. Children are naturally resilient, and challenges like this help them be introspective and think about who they really want to be. That can only be a good thing. Do you feel there are certain unique (or unusual) opportunities for schools in your area? I think it definitely helps that we are in an area that is currently undergoing a huge regeneration programme. We have some of the top universities in the world building new campuses within a 5 minute radius of us and we are also surrounded by some of the top private schools in the country. Instead of seeing this as a negative we leverage these organisations for maximum benefit for our students. By proactively engaging with these institutions we can provide opportunities and experiences for our students that they can then in turn leverage for university or apprenticeship opportunities. Its about being proactive and fighting for what you believe your students need. So being in central London is a definitive advantage for us. Having lived and worked in the North West I can see this clearly. How long do you think it will take to have the school where you want it to be? What are the next steps to getting there? This is a long-term mission; we are not going to solve these things over night and nor are we going to solve them by looking for quick fixes and focusing on league tables. We think that within 5 years we should be seeing the benefits of our approach; not only in the outcomes our students achieve but in the view they hold of themselves. Whilst this statement might seem patronising or demeaning, what I mean is that we want our students to believe that with hard work anything is possible and in our view a knowledge-led curriculum coupled to the powerful insights Adventure Learning provides is the best way of achieving this. So our next steps are quite simple; keep doing what we are doing, maintain the focus on the long-term and keep reviewing our implementation timeline to make sure we are not dropping any balls.